Sometimes it’s difficult to think up new and exciting anniversary ideas. It’s worth making the change from the usual dinner-and-a-movie thing, though. After all, your anniversary is the best opportunity you have throughout the year to show your partner just how much they mean to you. 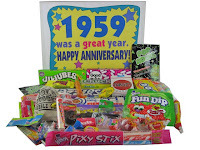 We have a perfect Happy Anniversary gift basket here at Woodstock Candy that can help you make the most of your anniversary. But we also have some other ideas to help make the day extra special. Take your partner out for a romantic nighttime picnic. If you can find a spot that has an overlook with an amazing view, that’s even better. Think of a place that overlooks a lake, a cityscape, or even just the top of a hill. It can be a great way to spend time together. Make sure your picnic basket is full of goodies. Wine, a salad, sandwiches, and some retro candy. 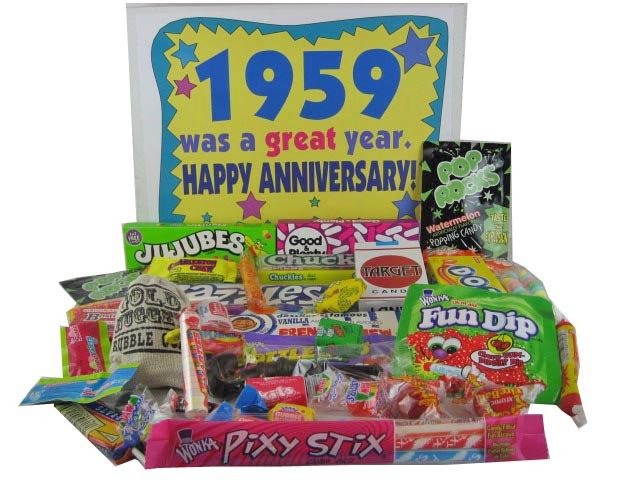 We can customize the year on the front of your retro candy anniversary box. Show your partner just how sweet you think they are! Cherry, Cherry... it's Neil Diamond's Birthday! Oh, Noooooo! It's Mr. Bill!